Running from May 11 to October 8, this wildly popular event is gearing up for a 2018 season filled with epic eats and live entertainment. There will be over 100 food vendors and 200 retail stalls this year. Attendees can expect to chow down on grub from 40+ food trucks in “hot food alley” and enjoy live entertainment all summer long. The Friday Night Market will also feature a 19+ beer garden, serving local craft beer and cider as well as Betty’s Vodka Iced Tea. The newest theme is a classic but cheeky one, The Great British Tea Party is available now through September 3, with seatings at 11 am, 1 pm, and 3 pm daily. Selections at this tea include Fairmont’s LOT 35 Tea, the Eton Mess with berries, meringue, and whipped double cream, and raisin and butter scones served with Devonshire cream and strawberry jam to name a few. When: Now through September 3 at 11 am, 1 pm, or 3 pm. Every Sunday this summer Cacao Vancouver will be offering a drool-worthy Latin-style BBQ. This event will run from June 10 to August 26 and offers patrons traditional “Carne Asada” from different regions in Central and South America. Come to join the Cacao family for a classic neighbourhood Sunday gathering. Reservations are required. Price: Single person platter $30; For two $50; For Four $95; Call 604-731-5370 to reserve. Experience an epic East Coast-inspired Sunday Seafood Boil without leaving the West Coast at Vancouver’s celebrated Boulevard Kitchen & Oyster Bar. Take a seat on the stunning downtown patio and tuck into a bounty of fresh-caught seafood – jumbo prawns, clams, mussels, crawfish and Dungeness crab –piled high on butcher’s paper and served with all the fixings, including Boulevard’s signature bacon cornbread and sweet Beignets for dessert. Market by Jean-Georges’ new weekend brunch, Belle Provence, kicks off on June 17 and will run until mid-September. Guests can expect Provençale-inspired dishes on the new brunch menu, including eats like baguette tartines, lavender lemonade popsicles, madeleines, French toast, and of course, rosé. The team at YEW seafood + bar is celebrating Summer by bringing back the ultra-popular family style- Dungeness Crab and Lobster Boil Dining Series. Guests will tie on a bib (yours to keep) and raise a complimentary glass of wine to begin the evening. This South Granville gem is offering a special season summer prix fixe for $39. The three-course menu will be available Sunday through Thursday and features dishes such as Sawmill Bay Oysters, Coho Salmon, and Guanaja Chocolate Souffle to name a few. This weekly series that features a savoury dumpling menu, DJ Chris Allen spinning vinyl, and a flashy disco ball setting the mood. Plates are $10 and guests can choose from an assortment of decadent dumplings including nettle and ricotta with wild greens and pork and burdock with charred chilli sauce. 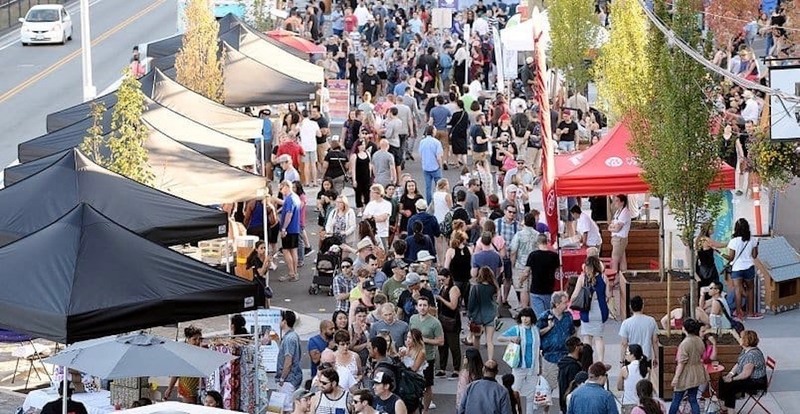 Fridays on Front takes place from 5 to 10 pm on the 600-block of Front Street, which is conveniently located just steps away from two Skytrain Stations (New Westminster, Columbia). Merchants will be closing its doors on August 16, but until then patrons can enjoy a special Last Supper Series. This string of dinners by Stephen, Mann, and returning chef David Jackman will be themed and put on regularly in August. The Infused Dining Series returns to Vancouver for the third time. Enjoy a five-course THC infused menu. The dinner is held at a private residence and each seating has space for 10 spots over the 90-minute experience. Come as a group or come solo and make new friends at their dinner table. Delicious plant-based dinner hosted at Meet in Gastown. Expect an off-menu, specially crafted dining experience, includes two drink tickets. All attendees will walk away with gifts from some of our favourite local brands including Juice Truck, Homecoming Candles, Saje Wellness, Eastwood, Blume, Vega, and more. Tacofino’s Gastown Taco Bar is hosting a Pride Party from 3 to 7 pm. DJ Gissala will drop the beats and four drag performers will strut their stuff during an event that features Happy Hour food specials until 7 pm and the Pride-themed RoSlay Sangria, which mingles rosé, fresh lime juice, El Jimador Blanco, agave nectar and soda with peaches, strawberries, blueberries and mint. From August 3 through 6, a dollar from each RoSlay ($8) and two dollars from each pitcher ($24) sold will be donated to QMUNITY, a local centre providing support and resources for the LGBTQ/2S community. This event has no cover but you’re recommended to purchase brunch. Doors at 11 am and the show starts at noon, seating is limited so get here early to secure your spot. On Pride Saturday head here for an extraordinary afternoon of international drag, brunch, and artisanal cocktails, all on a stunning Yaletown patio. Enjoy made-to-order omelettes, waffles, fresh fruit, mimosas, vegan options, a VIP gift bag, and much more. 100% of funds raised will go towards supporting QMUNITY programs and services. Each $75 ticket purchase will receive a $55 tax receipt.